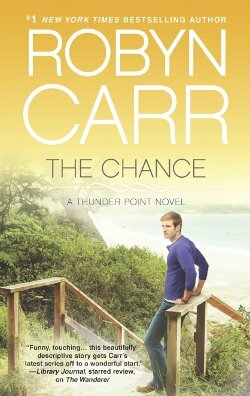 The Hope Chest Reviews is priviledged to be one of the stops on a blog tour celebrating the release of Robyn Carr's brand new novel, The Chance, the latest in her Thunder Point series. We have a review of the book, as well as an informative interview with the author, plus a chance to win a copy of the book. What fun! So without further ado, let's start the festivities with our Q & A.
Q: When you first created Thunder Point and started writing novels based there, did you have upcoming characters-like Laine and Eric from The Chance-in mind, or have they been developed since you created the town? How has the series evolved since the first three books came out last year? A: The really fun part about a long running series like this as that the characters appear as they're needed and they evolve. When I first introduced Eric in The Newcomer, I wasn't sure he'd have more of a story coming. When I started to think he was memorable enough for his own story and romance, I wasn't sure whom he'd meet that he'd fall for. When I introduced Laine in The Hero, I thought she might be just crossing the stage-but then I saw her meeting Eric and it all seemed to come together. Other characters have been there since the beginning of the series and have been calling out to me for their own story, like Dr. Scott Grant. Bless his heart-he has been ready for a special woman for a long time now. Q: Do you have a favorite place in Thunder Point? If it was a real town, where would you spend most of your time? A: If I lived in Thunder Point, I think I'd be at the diner every day. That seems to be where most people run into each other. It's a great place for a coffee break or breakfast-Stu, the owner and cook, doesn't screw up breakfast too badly. And another great place to have a glass of wine or a nice dinner is the nicest restaurant in town, Cliffhanger's in the marina. And finally Cooper's beach bar is the best place to view a sunset-he has tables on the deck and when the sun sets over those big, black haystack rocks, it's amazing. Q: What is the underlying message you want women to take away from The Chance? Not to be too corny, but what does chance have to do with it? And do you really believe in second chances? A: Eric and Laine are completely ill-suited for each other. Not only do they come from vastly different backgrounds, they like completely different things, but he's an ex-con and she's an FBI agent! And yet when they're together, the chemistry is overpowering. Even though all good sense says they should not pursue a romantic future, sometimes you have to go with your gut instinct and take a chance on the least likely match. Do I believe in second chances? Oh, yes. And third, fourth, fifth and so on. Things seem to work out just as they should. I love the quote from the movie The Best Exotic Marigold Hotel, "Everything will be all right in the end. If it is not yet all right, it is not yet the end." Q: Can you give us a sneak peak into what you are working on now? A: The Promise, another Thunder Point novel, is complete and being edited while I write The Homecoming, the third Thunder Point novel for 2014. In The Promise, Dr. Scott Grant finally meets the woman of his dreams. This young widower and father has been hoping to find the right woman for a long time and had nearly accepted the fact that he never would-and then a beautiful and brilliant physician's assistant enters his life. Peyton Lacoumette turns his world upside down and challenges all his assumptions about love and life. Right after The Chance comes a new women's fiction I dearly love. Like The House On Olive Street and A Summer in Sonoma, Four Friends examines the relationship of four women, all in various angst and crises, coming to terms with where they belong in their relationships and their friendships, all looking for their best possible selves. I lovingly refer to books like this as girlfriend books. The story is driven by the women's narrative but most definitely and intimately involves the significant men in their lives. It's by turns emotional, hilarious, revealing and transforming-and I love it. Read our reviews of Robyn's other books. The winner is Karen from Brenton, WV. Congratulations, Dora from The Hope Chest Reviews!